Designed to be lightweight and breathable, the Equisafety lightweight jacket is cut lower at the back and has a elasticated draw cord in order to remain fitted. This all weather jacket will protect you, no matter what Mother Nature throws at you. 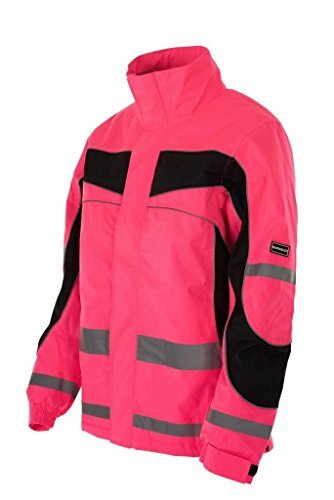 Designed for high performance it is made from Textile Intelligence waterproof breathable fabric and combined with a winning design, makes this jacket the best on the market. Designed with style and performance, giving you a trendy sports look. The unisex jacket is a great fit and is extremely versatile. Inside the jacket there is a zipped money pocket and cell phone pocket. It is 100% waterproof and breathable with taped seams. Rain and snow beads up and rolls off the surface of the fabric. It has 360 degree of reflection and fluorescent properties. With 2 large zipped pockets. It is fully washable on a warm wash. DO NOT put in dryer due to reflective tape. Not only is this jacket great for everyday riding, it is also great for high impact sports like cycling, running and long distant Endurance riding. If you have any questions about this product by EQUISAFETY, contact us by completing and submitting the form below. If you are looking for a specif part number, please include it with your message.